Second Circuit Judge James Hankinson, a graduate of Florida State University Law School in 1978, a graduate of Davidson College, Assistant State Attorney 1st Judicial Circuit, Assistant State Attorney 2nd Judicial Circuit, Assistant United States Attorney, Northern District of Florida, Chief Assistant United States Attorney, Northern District of Florida. Second Circuit Judge Jackie Fulford, a graduate of Stetson College of Law, appointed to the bench in 2009 to replace retired Circuit Judge Janet Ferris. Tallahassee Defense Attorney Gregory Cummings, a graduate of Thomas M. Cooley Law School, admitted to the Florida Bar in 1980. Lead Public Defender Nancy Daniels, a graduate of Florida State University of Law, admitted to The Florida Bar in 1977. Office of Criminal Conflict and Civil Regional Counsel Daren Shippy, a graduate of Samford University, Cumberland School of Law, admitted to The Florida Bar in 1985. Associate Medical Examiner Anthony Clark, Emory University, Massachusetts Institute of Technology, Specialty is Forensic Pathology; Board Certifications are Anatomic Pathology, 1994; Forensic Pathology, 1994. Wow! These people have many, many, many years of experience. If accurate, their resumes show more than enough competence to proceed through any criminal case. So why, oh why—did these people allow themselves to be oh, so DUMB? Assistant State Prosecutor Jack Campbell, a graduate of Samford University, Cumberland School of Law, admitted to The Florida Bar in 2002. In 2002, PEOPLE! And this guy is running the courtrooms—this guy is worth older experienced people being DUMB? Is State Prosecutor Jack Campbell being groomed to carry out CORRUPTION— or was he showing those how to get away with CORRUPTION? After DeShon was charged with the murders, who was more afraid, State Prosecutor Jack Campbell or his daddy, Leon County Sheriff Larry Campbell or State Attorney Willie Meggs? 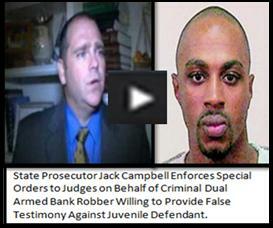 Clearly, someone had to be afraid of replacing State Prosecutor Jack Campbell. One thing for sure, the Campbell’s are making sure that they don’t go down alone. Times have changed! That Good Ol’ Boy mess is unraveling faster than it used too. Nobody is invisible—no matter what your affiliation—no matter what club you belong too.